The answer is no. Contrary to popular belief, rentals are not white. They are beige. Awful, bandaid beige. I have dreamed of having white walls for years. I think they’re beautiful, fresh, and modern. I love how bright they are, and how they look when you have big windows (which we have). I love white walls. In pursuit of the perfect white we set out for the paint section of Home Depot and picked out about eight different white paint chips to compare. Aaron was like, “I just don’t care, they’re all white” which stressed me out because I felt like surely there was some art to choosing the right color white. Aren’t there a million Pinterest posts clogging up your feed about all the best colors of white paint? What if I picked a bad one?! Then I realized that was crazy so we just kept it simple and got the color of white that comes in the bucket. No color mixing required. We bought a five gallon tub and set on our merry way home. Surprisingly, I haven’t really ever painted walls before. I grew up in a 110 year-old victorian house with adobe walls, so most of my wall experience has dealt with wallpaper—removing 12 layers of paper with nothing but a steamer and a putty knife followed by measuring, cutting and pasting up a new layer. Compared to the wallpaper, painting was a breeze though it did take a little longer than I expected which was a bit stressful because of our timeline. 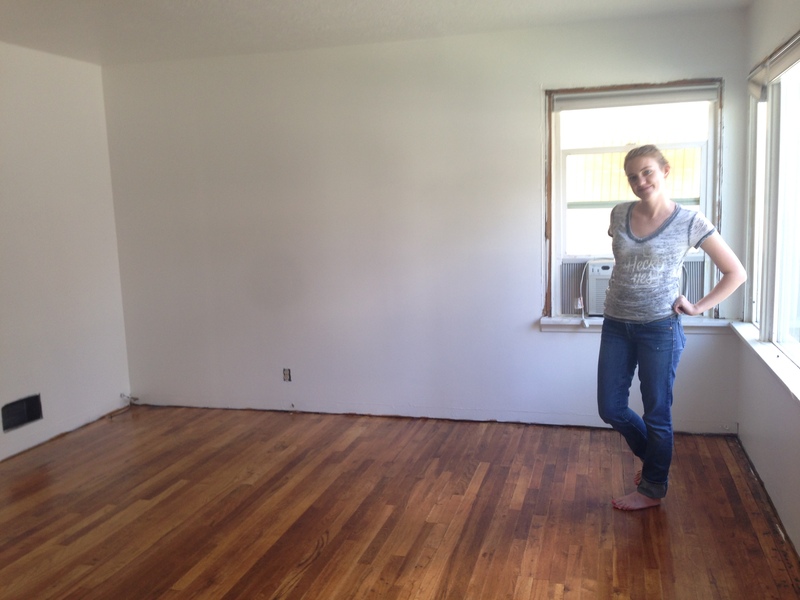 By the time we finally closed on our house I had exactly one week before I had to go back to teaching full time, and exactly two weeks before we had to move out of our apartment. 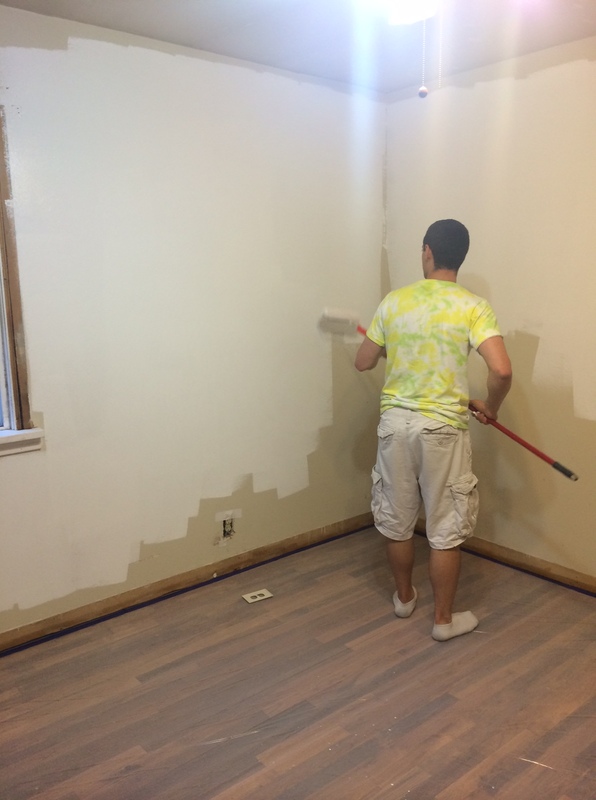 We jumped right on doing the floors, but by the time they were finished, the school year had started and we had less time to work on painting and moving. We recruited Aaron’s friends Dan and Greg to come and help us out which was awesome because it made the entire process go faster. Painting is one of those things you don’t think will take very long, but it’s just time consuming. 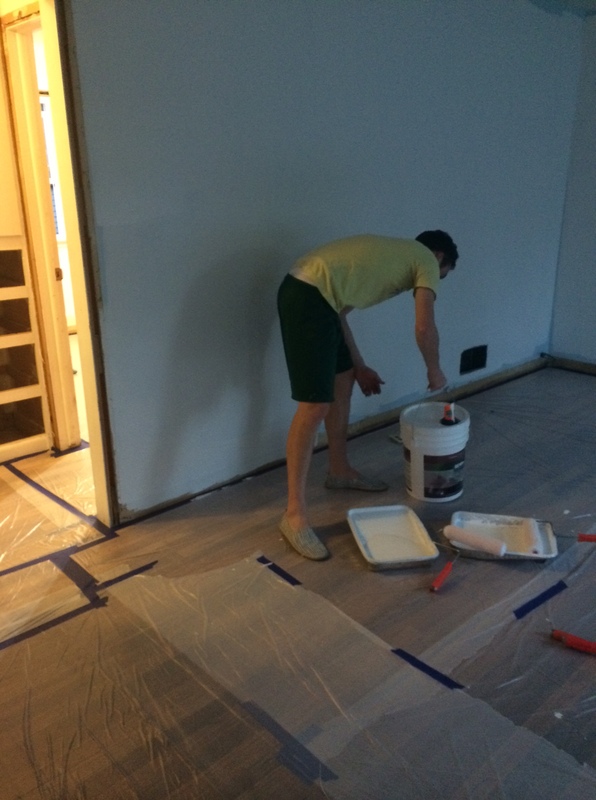 After our experience with sanding paint off the floors, we spent an eternity taping off every bit of our freshly refinished work. 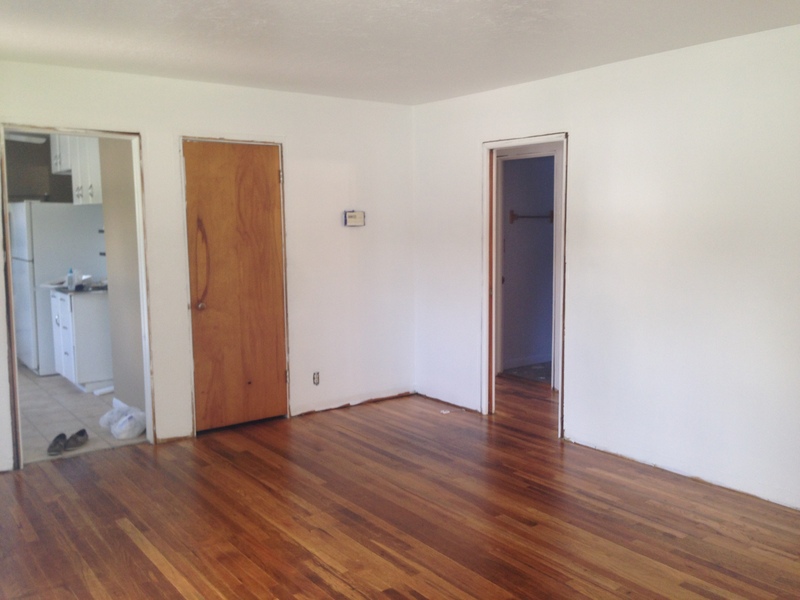 We didn’t want a drop of paint to ever touch that floor again! Dan and Greg were life savers! I think the white walls make the color of the floor look all the more beautiful. We still need to paint the kitchen and bathroom, but we thought that would be doable after we moved everything in. Next, we need to put on all the trim! Wow!! I think that you made a great choice going with white paint!! Can’t wait to see the photos with the trim all up. Looking Good! 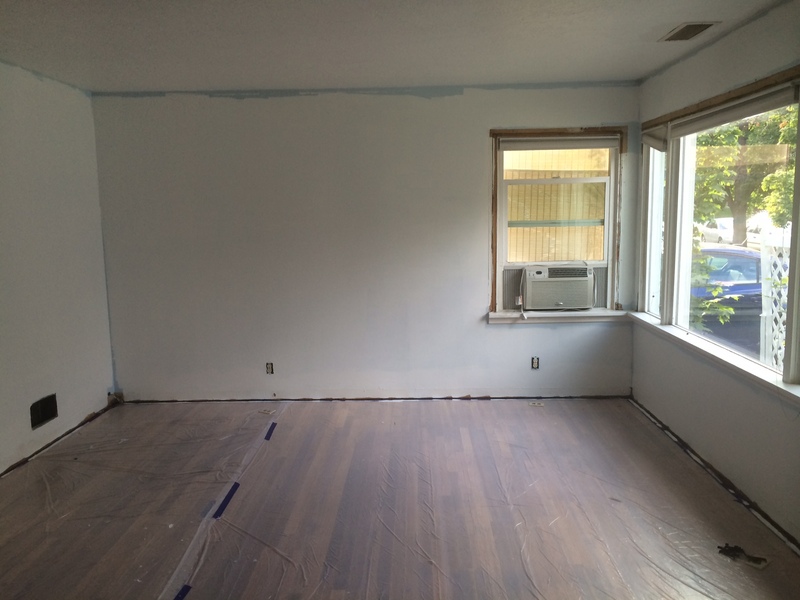 Keep up the painting and blogging!